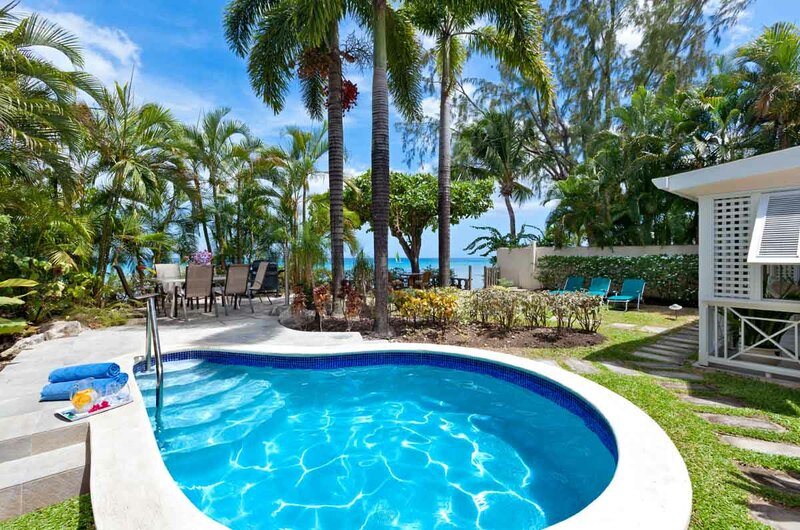 Milord is nestled in the family community of Fitts Village, St. James, on the West Coast of Barbados. The villa rests on the ocean sands with a panoramic view of the Caribbean Sea. It is a new three-bedroom home, with English Colonial period decor, and Zen tranquility. On the first floor is a well-appointed kitchen providing all the usual appliances, as well as an ample supply of dishes and utensils. There is a wood butcher-block centre island that also serves as a buffet. The living area has a large sofa and chairs, a wall entertainment centre for cable television, a DVD player, radio and wireless internet access. Adjacent to the living room is the dinning room, with high ceilings festooned with two colonial chandeliers, and a custom built mahogany table. Unique glass block windows, louvers and skylights make the room a bright, cherry spot to have breakfast, lunch and dinner. Also on the main floor is one bedroom with an en-suite bath, and an angled bed to catch the view of the ocean. The bathroom has granite counters, well appointed built-in cabinets, and a clothes closet. The living room and first floor bedroom each have large louvered doors that open onto a terraced patio where you will find an umbrella, table, chairs, loungers, a barbeque, and spa Jacuzzi. There is also an outside shower, a multitude of palms and tropical flower plants, and direct access on to the sandy beach. On the second floor are two bedrooms, both with en-suite baths and queen size beds. Each room is unique with early colonial, tropical and Zen decor. The bathrooms have granite counters, Italian tile and marble, and star chandeliers on the ceilings that direct your eye to the skylights. All of the rooms are air-conditioned, in addition to ceiling fans. The bedrooms are outfitted with flat screen televisions, DVD players, and Stereo CD units. Both rooms open onto a covered patio setting of wicker sofa and chairs with comfortable cushions. This is the perfect spot to enjoy the evening sunset. Milord has its own Villa Manager dedicated to the supervision of the staff; a Cook/Housekeeper when 4 people are occupying the villa or a separate Cook and Housekeeper when the villa is fully occupied. The Cook will prepare your breakfast, lunch and dinner according to your needs; the Maid/Housekeeper, will clean the villa and prepare your bedroom/bathroom, is responsible for the laundry as well as ironing your laundry as needed. Milord is a beachfront home. It should be noted that beaches change their shape and size from day to day, week to week and month to month, mainly as a response to seasonal waves, currents and tides. Every effort has been made to depict the beach in front of this property, but temporary changes may occur. This comfortable and affordable beach front villa is fully air-conditioned and sits on a quiet stretch of beach in Fitts Villa, with a private pool and walking distance to the local supermarket, cafes and bars. Perfect for families seeking a relaxing holiday on the beach.